Posted on January 28th, by Dr Rob Yeung . Do you want to be able to communicate more compellingly and effectively? 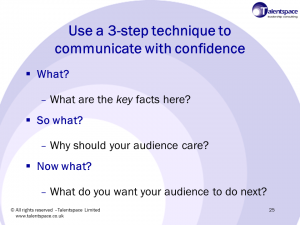 If you do, then consider using a simple 3-step structure for organising your message. You can use it whether you’re giving a quick update in a meeting or delivering a lengthy formal presentation. You can write a set of presentation slides using this structure. You can also use the 3 steps to organise a report or email. What are the key points that you wish to convey? If you only have a minute to get your message across, then what are the one or two things that you absolutely want to share? Even if you have more time for say a formal presentation, bear in mind that too much information risks swamping the most critical points. Next, explain why it should matter to your audience. Whether you are communicating to just one colleague or a hundred customers, explain to them the implications of the points that you are making. Why should this matter to them? Often, people wishing to convey a message assume that the reasons why people should care about the message are obvious. But remember that what is clear to you may not always be apparent to other people. Finally, the third question invites you to share with your audience what you want them to do differently as a result of your message. Sometimes, there may be no action that you are requiring of them. But consider: do you want them to start doing something differently – or perhaps to stop doing something that’s harmful or unhelpful? When I was running a workshop recently on the topic of confidence, the several dozen people in the room all found the “What? So what? Now what?” structure immensely useful. So I’m sure you will find it useful too. I have seen how this structure has helped many clients to communicate more effectively and confidently. However, do also consider using psychological techniques to give you an extra boost if you need to feel and appear more confident.